As well as offering an excellent dining environment, we at Golden Star also offer a takeaway service. For your added convenience, this service is open 7 days a week, from 4:00pm to 12:30am. In addition, we offer a home delivery service, with prices starting from just ?£1.50, and we cover the local area, including Dumbarton, Alexandria, Bonhill, Renton, Balloch, Gartocharn, Crofthamie, Drymen, Balmaha, Luss, Arden, Arrochar, Tarbert, and Ardgarten. If you are staying in a local hotel or camp site, please do not forget that we can deliver to you. In addition, we can cater for functions. Next time you require delicious, authentic Indian cuisine, delivered straight to your door, give Golden Star a call on 0138 972 1077. Here at Golden Star, we offer a wide range of delicious and nutritious Eastern dishes, including korma and nantara, as well as offering a wide selection of European and vegetarian cuisine for you to choose from. We offer highly competitive prices, along with a free loyalty discount card (please ask for details). In addition, we provide excellent customer service, treating all our customers as valued guests, and striving to make everyone feel welcome. Much has changed in the past quarter of a century – both locally and globally. One thing that has not changed and will not change is our standards here at the Golden Star in Balloch, Loch Lomond. We are as committed now as we have always been to providing great food at a fair price, and to providing a vibrant, family friendly environment, each and every time you visit our restaurant. In addition, we have 46 seats, meaning that we can accommodate larger groups. So next time you are looking for somewhere to have a meal with friends, family or colleagues, give us a try and discover why Golden Star has developed such an excellent reputation. Here at the Golden Star, we pride ourselves on offering a wide range of mouthwatering dishes for you to choose from. We use only the freshest ingredients, and our kitchen staff have a wealth of experience to call upon, and are committed to ensure that your food is as delicious to the mouth as it is appealing to the eye. 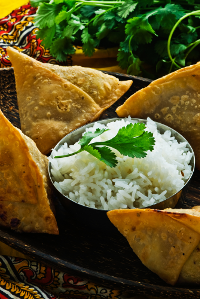 We offer both Indian and European dishes, and our range of options includes a selection of ice creams for dessert, to round off a perfect meal. Call us today to find out more! If you are a vegetarian, then you will love the Golden Star. We have a huge variety of vegetarian options, including mixed vegetable curry, vegetable rogan josh, Bombay potatoes, and mushroom bhaji, to name just a few. To find out what other vegetarian options we offer, call us on 0138 972 1077.